After a successful completion and launch of Nike Running Team’s version 1, Daniel Won was chosen to redesign the Nike Running Blog. and also promoted products and running tips through famous athletes like Goucher, starring Adam and Kara Goucher. On the blog, we also presented major running events including NYC Marathon, Boston Marathon, and Nike Women’s marathon. Because NYC Marathon required a form for sign up to a newsletter, Daniel created a WordPress plugin specific for Nike’s requirement which sends the sign up information directly to the Nike’s representatives. This plugin is adaptable to apply to any of the posts on this blog. When Daniel Won completed the Nike Running Blog, Apple used this site as one of the tutorials for the first generation iPhone. 1. Built redesigned layouts into a website. 2. Created a wordpress plugin for Nike’s specific requirements. 3. 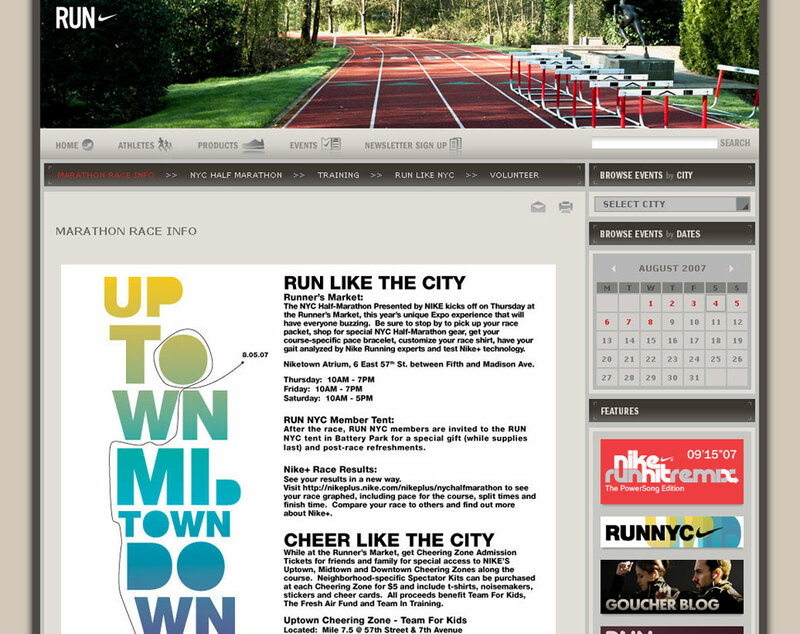 Created specific pages for official Nike Running Events. 4. Created a page for Coach Bob and also for the Goucher Blog. 5. Added customized email plugin. 6. Added customized print plugin. 7. Created user – friendly search page for the blog.